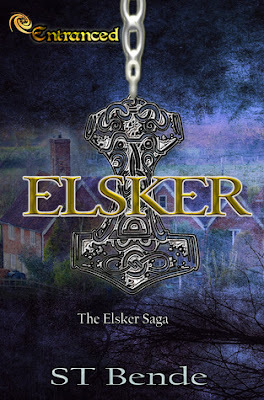 Review: 4 Stars - Elsker, the first title from the Saga with the same name by author S.T. Bende is a mythology lover’s dream book come true. With immortal assassins, God of Winter, prophecies, visions and an old fashioned romance there’s more than one thing to fall in love with in this novel. Kristia is a normal girl living in small town USA. With dreams of wanting more she takes some time abroad to finish her studies at Cardiff University, Wales in the beautiful British Isles. What she never expected to find there, was much more than she could have dreamed possible. One thing that I loved about Kristia is that she’s just so normal. I mean things happen later on in the book that make her much more than average but even when things change she’s still your everyday girl next door. I liked that about it, it was refreshing. On a trip to London before starting school she has a brief yet memorable encounter with a man in a museum. It’s not pleasant, yet she can’t get him out of her head. Her roommates are great! They help her acclimate to the new place and people and help Kristia to get a lay of the land. And then we have Ull who is very protective of whom he lets into his life. He’s pretty closed off except for his two friends Gunnar and Inga. This only makes him more mysterious on campus and Kristia. The two have a sweet and slow brewing relationship. There’s romance, thrilling danger and mythology and… I’m serious; this book has a bit of everything! I have no idea why it had slipped by me earlier in the year when it was first initially released but I was so thankful to have meet author S.T. online during a blogger event and in turn found this gem of a book. The writing flows with ease, the story keeps you either swooning or on your toes and sometimes both at the same time. The characters will leave an imprint in your heart and mind for a long time to come. Trust me when I say that as soon as I finished this one I was ready for the next title “Endre” right away. Thankfully I didn’t have to wait too long which makes it prefect for a day where you can read both back to back, which I highly suggest. All in all, Elsker is pretty fantastic. The “New Adult” category is growing more and more popular everyday and having a chance to read something other than a contemporary title in one of my favorite categories was extremely welcomed. I highly recommend this title to those who are looking for a bit more in a “New Adult” title with romance between two lovable characters and action that’ll keep you rooting for the good guys and ready to crush the bad guys. So, go grab this one today and have fun meeting Ull, Kristia, Gunnar (swoon! ), Inga and all the other amazing characters. Enjoy!